We are the sole owners of this website and we only collect information that you voluntarily give us via email or on the phone. We assure you that your information will never be sold. to contact you regarding English Bulldog. No sharing with any third party. Here you consider your privacy as a number one serious issue. 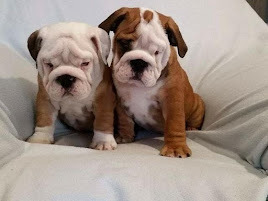 Order English Bulldog Puppies now. All puppies listed on the Puppies page will have different prizes. All prices are firm and non- negotiable. We do accept deposits and monthly payments on future puppies. web site will not be honored. Please call us to confirm pricing. deposit is $300.00. Deposits are fully refundable. then place the puppy on reserve for you until we receive the deposit payment. If we do not receive the deposit on time as will be agreed, the puppy goes back up for sale. Full payment of the puppy is due when the puppy reaches 8/9 weeks of age or at time of pickup. agreement before boarding costs are charged. This does not apply to individuals who need the puppy shipped to them, however, payment must be paid in full before shipping will be scheduled. approximately 15 – 24 hours later. (B) 1-day – $300. Puppy’s are shipped out and arrive within maximum of No limit. Orders placed before 1 pm EST arrive in 2 business days hours . before 9 AM EST may arrive the same day. because we wouldn’t feel right if we just address them with a moniker that’s for the whole, like “doggy”. To make them special, it was our initiative to call them something that’s solely their own. It’s less confusing this way, too. The golden rule says you shall not do unto others what you don’t want them to do unto you. We do not treat these puppies as if they’re products for sale. Indeed, they are being distributed but our means of doing so is less harsh. We do not ask customers to just pay for them. pup that’s ready to be in his home once you have finished your dealing with us. There is no need to worry about anything else. You’re free to enjoy your adopted puppy. After purchasing one or more of the puppies for sale from us, we still have your back. that this small note about us brings you closer to understanding who we are and how we operate our business. Please feel free to call or email anytime with questions or concerns. the puppy to their nearest major airport. All shipping costs are paid by the buyer. We charge a flat rate of $200 for delivery. During warmer months (May - September) the price may be higher to farther airports to VIP the puppy. that support live animal shipments are accepted for transport. ship at a schedule that permits us to ship the puppy. If you wish to drive and meet us we can meet you half way by car (no more than a 1 hour drive for us in one direction) for a fee of $150 if you prefer to do this instead of shipping. 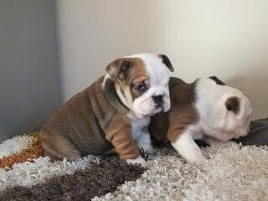 As professional breeders we always strive to produce English bulldog puppies meeting the breed standards, with good conformation, and with the best possible health. But please remember that we are working with live animals, that may develop illnesses common to the breed, viral infections that can be found anywhere in the environment, and even sometimes congenital illnesses that may have been present in either bloodline several generations back. will preserve the overall health of your new English bulldog puppy. confirm the puppy is fit for sale and to join a new family as a family pet. If your puppy, in the opinion of the veterinarian, has any physical problems considered to be life threatening, we will provide you with a healthy replacement puppy of the same value. If there are no puppies available, one will be provided from our next available litter. builder, as directed by the manufacturer, for the entire guarantee period. Failure to do so will render this guarantee null and void except where prohibited by law. Plus beyond the guarantee period to promote optimal health for a lifetime. To make a claim, you must return the puppy back to our home within four (4) days of receiving him/her. Also, include a signed statement from the veterinarian providing the date of the examination and an explanation as to why the puppy’s health is at risk. The statement must include a description of the symptoms supporting the opinion of the veterinarian. Depending on the findings we as breeders have the right to request a second opinion from an unassociated veterinarian. If the puppy dies of a birth defect within one year of the time of purchase, Terrific Bulldogs will provide you with a replacement puppy. You can make a claim only if you have kept the puppy under the care of a licensed veterinarian. This must include all vaccinations recommended by the veterinarian. You must also provide a signed statement from your veterinarian including the cause of death and a copy of ALL of your puppy’s health records. Failure to have the puppy examined within two (2) business days from receiving your new English bulldog pup, VOIDS THIS WARRANTY. Under no condition will we replace a puppy, where we are not advised of it’s being ill beforehand, or “put to sleep” without our permission.